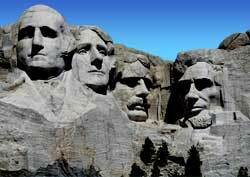 The heads of four renowned American presidents are hewn out of the upper cliff of a granite mountain in the remote Black Hills of South Dakota. The faces are as high as a six story building. The composite Mount Rushmore entity is the largest completed carved artwork in area in the world. If you would erect a statue of Washington proportional to his carved head, he would be about 140 meters (460 feet) tall. It was started on the left of Washington's. However, before it was completed, the engineers discovered that the rock was too weak. So, the workers destroyed the Jefferson visage and began it anew on the right side, where it is today.